Project Green Schools 2018 Green Difference Awards - Planet Aid, Inc.
Project Green Schools Board of Directors with some of the awardees at the ceremony. 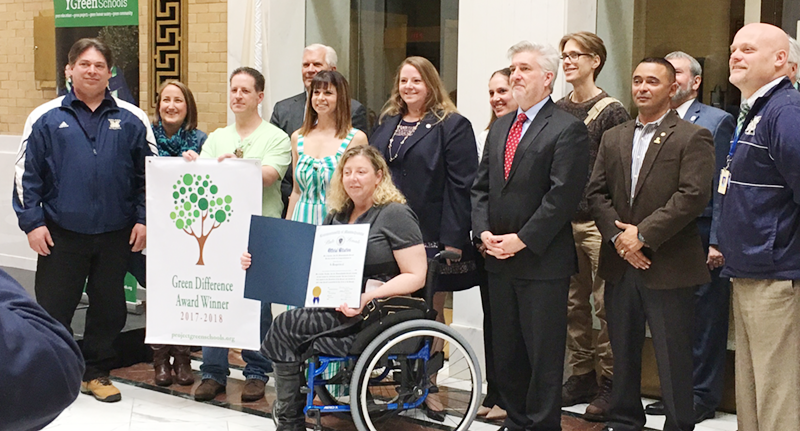 On April 13, Project Green Schools held its annual awards ceremony: the Green Difference Awards. The event, held at the Massachusetts State House in Boston, honors students, schools, and other green heroes whose efforts helped protect the planet. Planet Aid — a PGS sponsor for over eight years — was in attendance at the event to congratulate the awardees. “The partnership between Planet Aid and Project Green Schools has had a measurable impact on our planet." At the ceremony on Friday, PGS awardees were recognized for their outstanding commitment and contribution to the mission of PGS. Fernandes helped congratulate the winners and also accepted a certificate of appreciation on behalf of Planet Aid. Left: Fernandes showing the Certificate of Appreciation Planet Aid received from PGS along with WCVB's Anchor Duke Castiglione. Right: Fernandes speaks during the awards ceremony. Schools that are looking to make greener choices are encouraged to join PGS and start a National Green Schools Society chapter. Using PGS’s tool, 12 Pathways to Greening Your School, schools and students are better equipped and knowledgeable about making green choices for themselves and their communities. Planet Aid supports the PGS 12 pathways—from waste management, to saving water, to promoting green consumerism. Many schools, PGS members and nonmembers alike, work with Planet Aid to promote green living by hosting a yellow bin. To find out more ways your school can partner with Planet Aid in greening up your environment click here. The PGS Board with some Green Difference Award recipients.